Stair lifts and vertical platform lifts help make your home easier to live in. 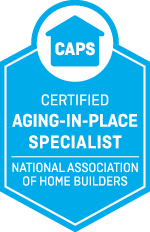 As the older population in the U.S. continues to grow, we are serving more folks looking to create homes they can stay in the rest of their lives. The number of Americans aged 65 and older is forecast to grow to 55 million in 2020, but only about 3.5 percent of homes offer the basic features necessary to even considering staying in your home long-term as you grow older. Whether we like it or not, 80 percent of us in that group will require accessibility solutions to help us stay at home. That’s where products such as stair lifts and platform lifts come into play. The names sound uninviting, but they are essentially just tools to help you get from point A to point B, in a vertical direction; much like an elevator. So, if you have stairs in or outside of you home and you wish to stay in your home, now is a great time to start thinking about how you can use these two types of products to keep you where you want to be, later. Essentially, a stair lift is a chair on a motorized railway which is able to go up and down a staircase. Sometimes, these products are also referred to as stairlifts, chair lifts or stair gliders. The primary focus of these stair lifts is to safely get people up and down a set of stairs. Many products today are able to accomplish this, as well as blend well into a person’s home. For people who are a little older, stair lifts can help you regain the use of the other levels of your home, such as upstairs bedrooms, bathrooms or studies. They are particularly attractive for folks who sometimes have a difficult time going up and down stairs. Or, for those who want to prepare for their future by getting their homes ready for late life. The primary benefit of stair lifts is safety. Since falls are responsible for more accidents in the home than any other cause, these products can help save you from injuries and the associated medical expenses. Safe living solutions offers a wide variety of stair lift models to suit the look of your home, as well as a variety of features in the different models and installation services that will help them perform the way you need them to. There are models available for interior or exterior staircases. A vertical platform lift is a powered machine that is designed to take you vertically from one level to another level. Much like an elevator, but for shorter distances. They can be used inside a home or outside. They are also commonly referred to as a “porch lift”, since often you see them used to get people from the ground level up to a porch on their home. The platform lift is used by many people for different reasons, including those who have difficulties navigating stairs, or who use a wheelchair, walker or other mobility device, so they can go up and down stairs without having to fear for their safety. Many times people choose to install a vertical platform lift for its compact size. In most places, there are minimum requirements to be met for the length of a ramp for it to be safely reach the level of a porch or deck. Since they take up less room than a ramp, so many people find them a more attractive option. We offer our clients some of the best vertical platform lift options by the most respected manufacturers. At Safe Living Solutions, we strive to provide our clients the best products to help you achieve your goals at home. That’s why we strictly recommend Bruno and Harmar stair lifts and vertical platform lifts. These two brands provide the highest in quality, ease-of-use, safety and customer satisfaction. They have wonderful support, have easier installation and warranties for your protection. For over 30 years, Bruno has helped people improve their lives at home through better mobility. Their products are engineered and made in the USA, but are available worldwide. Bruno has a full line of stairlifts and vertical platform lifts to assist people at any level of mobility. Bruno is a family-owned company, committed to quality and the safety of the people they serve. Harmar is a leading manufacturer of automobile wheelchair lifts, and stair lifts vertical platform lifts for the home and commercial buildings. For almost 20 years, Harmar has been helping customers meet the challenges of day-to-day mobility issues. Our commitment to the safest home possible is why we are proud to offer these brands to our customers. Whether you require a stair lift in your home, or a vertical platform lift outside of your home, we can help you remove these obstacles of your home. Serving the Piedmont Triad: High Point, Greensboro & Winston-Salem areas.